Yahoo! Calendar Integrated with Yahoo! Mail | No Soap, Radio! 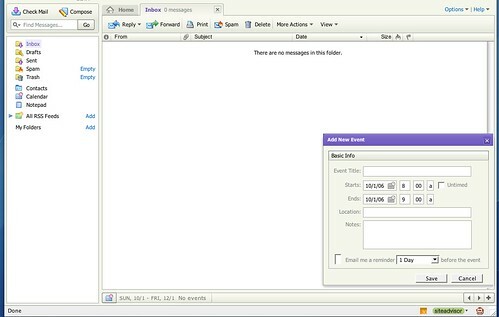 Yahoo appears to have quietly incorporated some calendar features into the beta version of their web mail product. This includes a timeline of events and a much slimmed down version of their entry box. Any rumor about a Google product creates a frenzy. Yahoo deserves a bit more blog play! You’re totally right – cool feature, but the problem of Yahoo Mail’s intolerable slowless is still… uhh… intolerable! It seems that Yahoo has been on the offensive lately, but (IMO) they are following the path of becoming over feature-rich, as opposed to simply improving the experience. I have tried the beta on three separate occasions, but always returned to the regular mail experience, because the shiny new Yahoo features are just too dang slow and unresponsive. If Yahoo is to be successful, they should take a cue from leaner web apps, and concentrate on experience instead of shine.